Kemi is a town and municipality of Finland. Kick off your visit on the 7th (Wed): take in the spiritual surroundings of Kemi Church and then pause for some serene contemplation at Tornio Church. To find more things to do, where to stay, and more tourist information, read our Kemi trip itinerary maker tool . Oulu to Kemi is an approximately 1-hour train ride. You can also take a bus; or drive. In November, daytime highs in Kemi are 0°C, while nighttime lows are -5°C. Finish up your sightseeing early on the 7th (Wed) so you can go by car to Levi. Kick off your visit on the 8th (Thu): get a dose of the wild on a nature and wildlife tour, don't miss a visit to LUVATTUMAA - Levi Ice Gallery, and then have some family-friendly fun at Kid's Land. 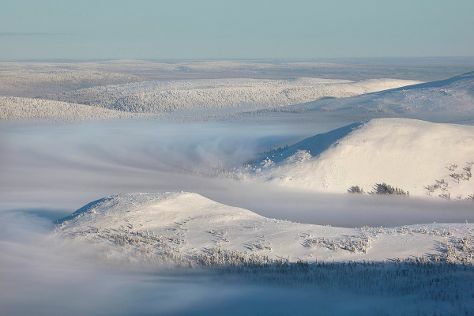 On your second day here, glide through natural beauty at Pallas-Yllastunturi National Park. For more things to do, where to stay, maps, and tourist information, go to the Levi attractions planner. Traveling by car from Kemi to Levi takes 4 hours. Alternatively, you can do a combination of train and bus; or take a bus. In November, Levi is little chillier than Kemi - with highs of -3°C and lows of -11°C. Finish up your sightseeing early on the 9th (Fri) so you can go by car back home.